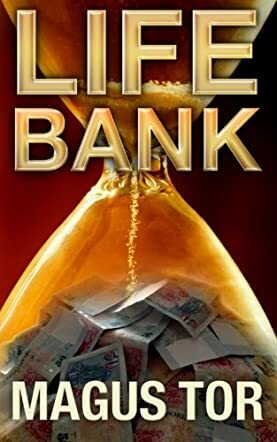 Life Bank by Magus Tor is a novella following the life of Daniel Chia, and chronicling the consequences he faces after making a deal with an otherworldly being. After a fruitless interview, merely one in a string of them, Daniel is approached by a man named Raphael, who gives him a bankbook with cheques, and tells Daniel that the number inside was the value his soul was still worth, a number in the millions. Each time Daniel uses the bankbook, he will lose an hour of his life per every $10,000. At first Daniel is rightly skeptical, but after his mother hurts her hip, all thanks to his neglect, Daniel decides to draft a LifeBank cheque to cover the hospital bill. He receives the money in record time. Still, despite the ease, Daniel takes things slowly. The lure of quick cash soon enough lulls Daniel into complacency. Though he still doesn't use the book often, he does use it to supplement the lifestyle he's grown accustomed to from his trading and pub businesses. He becomes so money hungry that he neglects his family, and eventually loses them. How much else will he lose before he learns that money is less important than other things. The message of this story reminded me a lot of Stephen King's Needful Things. Part of that is that the 'devil’ doesn't make you do anything. You get choices; the choices are still up to you. Now, though Christian mythology is referenced several times in the course of the story, I felt that the 'demon’ in question was a genie or similar being that secured his own freedom. He was trapped, with less power than 'Satan’ boasts, yet still quite powerful. Given that they are in Singapore, and are Chinese, a supernatural being from Chinese mythology seems more likely and appropriate. When Daniel’s debt comes due, we learn more about this mysterious man and why he was so eager to give away the LifeBank book. I did like that the temptresses were named Lucy, like short for 'Lucifer’, if sticking with Christian mythology. A solid story concept, and I have little doubt Tor will continue to flourish and grow as a writer.